Ever since the True North Sports & Entertainment purchase of the Atlanta Thrashers everyone has wondered what the name and logos of the new Winnipeg franchise would be. The name was revealed during the NHL draft. The franchise would keep the old name and once again be called the Winnipeg Jets. However, there was no logo or jersey for the new NHL draftees to wear for the photo ops with the organization's front office. The Winnipeg faithful that had waited so long for a team to return to the Manitoba capital would have to wait a little bit longer. The wait is now over. 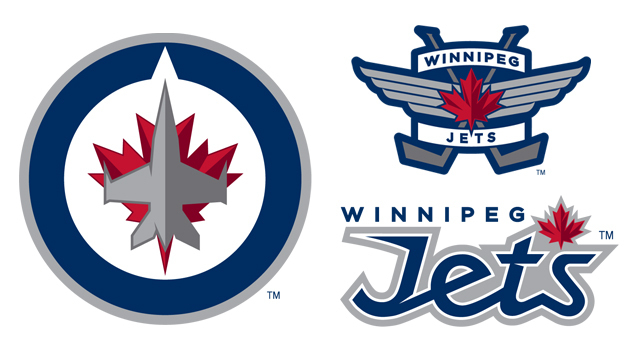 Via there team website, the Winnipeg Jets released their official logos. Having no resemblance to the logos of Jets past, but a new revamped main crest and shoulder pieces. Imagine big Dustin Byfuglien coming down the ice with that on his chest, mine as well be an actual jet. Pass or fail on the new Jets logos, sound off below.